What is a 50:50 Show? Answer: A magical money making miscellany! The South Downs Magicians perform Family Magic 50:50 shows for schools, charities and organisations. You, the booker, provide the venue and the audience, we provide the show. Together we set the ticket price and the capacity of the venue. We set a minimum figure we would like to receive from the evening or 50% of the total takings whichever is greater. We will provide a poster which you can print and distribute. We will produce a programme. You retain all catering profits and we do the same for the programmes. 7.00 Doors open with close-up magic in the auditorium prior to the show. 7.30 - 8.15 First half with 3 or 4 magicians performing their acts. INTERVAL during which we have close-up magic in the audience. 8.45 - 9.30pm Second half with 3 acts. Lighting and sound we can discuss but a show can be performed anywhere - you just have to find a way. We can work on a stage or a raised platform. In two venues where we have performed, mats were placed in front of the performing area so that children have a good view. 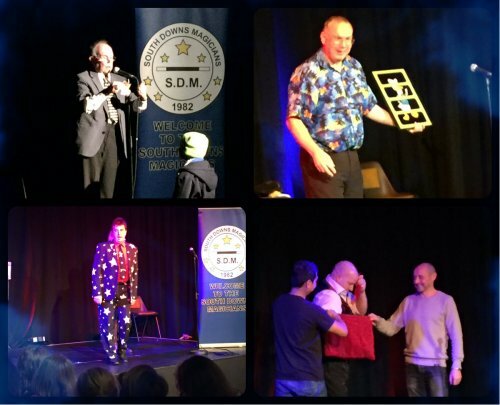 Over the years the SDM performed 50:50 shows at the Ropetackle Arts Centre, (Our fifth annual show there was in January 2018); Holmbush Primary School; (the Head teacher saw our show at the Ropetackle) and for the Storrington Players, a dramatic society who turned their evening into a supper event. The SDM have also performed and raised money at Handcross WI and Warninglid WI as well as schools in Crawley. We sold out (180 tickets) at the Ropetackle Arts Centre in January 2014, January 2015, March 2016 and January 2017 and 2018. A Saturday evening works well but second choice would be a Friday evening - no school the next day for the children! As far as dates go we are open to suggestions. This would be a Family Magic Show suitable for children, adults, Grandparents etc... very wide potential audience. All of the above can be discussed fully and a meeting with you can be arranged to view the venue and agree pricing etc... we can possibly also agree a maximum figure we would take from the event. Please contact our President to help arrange the details of your event.